As a Parish of the Catholic Church, we participate in the Sacramental Life established by Our Lord Jesus Christ. Faithfully, our parish clergy administer the sacraments of Baptism, Penance (also called “Confession”), Eucharist, Confirmation*, Holy Matrimony, and the Sacrament of the Sick (also called “Holy Unction”). To arrange for a Baptism of a child, youth, or adult, please contact our parish office at 920.435.7548 for further information. Persons over the age of 5 years, will need to take part in a period of instruction prior to their baptisms. For persons under the age of 18 who desire any or all of the Sacraments of 1st Penance, 1st Eucharist, and Confirmation, 2 years of active attendance and participation in our Veritas Faith Formation Program is required. Some exceptions are possible for those who have attended Catholic Schools or the Religious Education programs of other parishes. Contact our Faith Formation Coordinator, Michael Lee, at 920.437.0651 for further information. Adults (persons age 18 or older) desiring to become Catholic or to receive any sacraments they may have missed, may Contact Michael Lee in the Faith Formation Office, 920.437.0651, to make arrangements for whatever instruction may be necessary. Persons desiring to receive the sacrament of Holy Matrimony should contact Margo Thorsen (for English-Speaking) or Sr. Martha (for Spanish-Speaking) at 920.435.7548 for information on the process of preparation for Marriage in our parish. At least one party to the marriage, either the man or the woman, must be an active member of our parish. The Sacrament of the Sick is offered regularly, twice per year, in the Spring and Fall, and is announced in advance in our Parish Bulletin. Those in need of this sacrament at other times, and in an emergency, should contact the parish office at 920.435.7548. 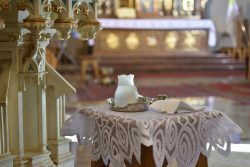 * Confirmation – While the Sacrament of Confirmation is normally administered by a bishop, pastors (priests) are given faculty (authority and power) to administer Confirmation in certain circumstances, such as during the annual Easter Vigil in their parishes. ** Bishops – Under normal circumstances, a man who is to be a bishop is ordained and consecrated by 3 other bishops.